A1 Microwave is a UK supplier with the slogan " The world's smallest and lowest loss filters". This relates to the waveguide filters, couplers, combiners and diplexers, whose excellent quality and compact size result from the precision milling production method of A1 Microwave. The main markets are SATCOM, RADAR, radio links, communications from UHF to Ka-Band. 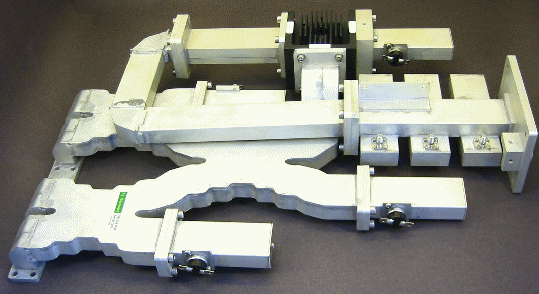 A1 Microwave welcomes inquiries for customer specific waveguide assemblies (see picture above). New: Low-Loss Combiner for X-Band, 2-Way and 4-Way with low insertion loss (0.3dB) and ideal amplitude balance (0.03dB) and phase balance (0.3°). Overview A1 Microwave filter products (pdf).